Located in the heart of Colorado’s Rocky Mountains along the Interstate 70 corridor, Glenwood Springs is within easy driving distance of Denver, Grand Junction, Aspen or Vail/Eagle airports. With an original rail stop that dates to the town’s early days, Amtrak trains continue to make daily stops, dropping visitors in Glenwood’s historic downtown as they have for over a century. Glenwood Springs is 160 miles west of Denver on Interstate 70 and about a 3-hour drive from Denver International Airport. Grand Junction, Aspen or Vail/Eagle regional airports are even closer options for fly-drive. Boasting over 1,700 sleeping rooms and an ever expanding inventory of meeting space, Glenwood Springs is ripe to host a variety of groups. Whether you have a corporate meeting, military or family reunion, wedding, or bus tour group, Glenwood Springs Visitor Center is an excellent resource to assist in finding a venue that compliments and enhances the focus of your gathering. Of course, the best advantage of bringing your group to Glenwood Springs is the wonderful variety of attractions and activities that can be enjoyed any time of year. If you’re hosting a large conference, banquet or company retreat, Glenwood Springs, Colorado offers a variety of large spaces perfect for accommodating groups of any size. Below we have provided a list of locations providing enough room for large events. Unmatched anywhere else in the Roaring Fork Valley, historic Hotel Colorado’s 10,000 square feet of meeting and banquet space offers something for everyone. Whether you’re looking for a place to hold monthly meetings or the celebration of a lifetime, the staff of this award-winning hotel welcomes the opportunity to serve you. Capacity: Up to 500 people. Operated by Colorado Mountain College in partnership with the Garfield County Public Library District. Morgridge Commons is a new, state-of-the-art, meeting and learning space that is flexible, collaborative and community focused. Morgridge Commons is a warm and inviting environment that is ideal for productive meetings, training sessions and retreats away from the office. Meeting rooms are competitively priced for non-profit, government and for-profit organizations. Rooms will accommodate a variety of group sizes from small executive meetings, 20-60 people and groups up to 373 people. Most rooms offer natural light and mountain views and the space is enhanced by murals from renowned Colorado artist John Fielder and an onsite art gallery. The Glenwood Springs Community Rooms are available for meetings, weddings, family reunions, office parties or special events. The Community Center has over 3,000 square feet of facility rental space. Capacity: Up to 200 people. Offers a variety of different size study and meeting rooms. Small get-togethers or grand events, rustic settings or elegant ballrooms, Glenwood Springs can accommodate groups of up to 500 people in spaces that range from a cozy 390 square feet to capacious facilities of 6,000 square feet. The following meeting rooms are located in properties with lodging and are sorted by size from largest to smallest. The Brettelberg is located on the slopes of the Sunlight Mountain Ski Resort in Glenwood Springs, Colorado. Capacity: up to 100 people. Perched high above the Colorado River with spectacular canyon and river views, the Canyon Club Event Center at Glenwood Canyon Resort opened in spring of 2011. This 8,000 square foot facility is ideally suited for corporate retreats and social events. The mixed use space combines indoor and outdoor venues and easily hosts groups of up to 235 guests. A zipline and high ropes course are available for corporate team building activities. Accommodations include two new luxury suites on the top floor of the Canyon Club Event Center, several cozy, fully equipped cabins and RV and tent sites. Capacity: Up to 75 people. It’s located on the grounds of Glenwood Hot Springs, and it is steps from the pool, but you might feel the Glenwood Hot Springs Lodge is a world all its own. Capacity: Up to 60 people. Experience the bright side of group travel planning with personalized service, and easy reservation processing. Meeting space is FREE of charge for groups booking more than 8 rooms. Capacity: Up to 60 people. Silver Spruce Inn in Glenwood Springs, Co is nestled in the heart of Glenwood Springs. It is within a walking distance from most of the town’s major tourist attractions. Capacity: Up to 60 people. Located right next door to the Residence Inn, the Courtyard by Marriott is ideally suited to business and corporate gatherings with exceptional features such as connectivity, private media booths with HDTV’s, a business library featuring computer terminals, and a GoBoard-52 LCD touch screen packed with local information, maps, weather, business and sports news. The Courtyard by Marriott can host a meeting for to up to 50 people. Both of these Marriott properties are located in the Meadows Shopping Area beside the Glenwood Springs Community Center. 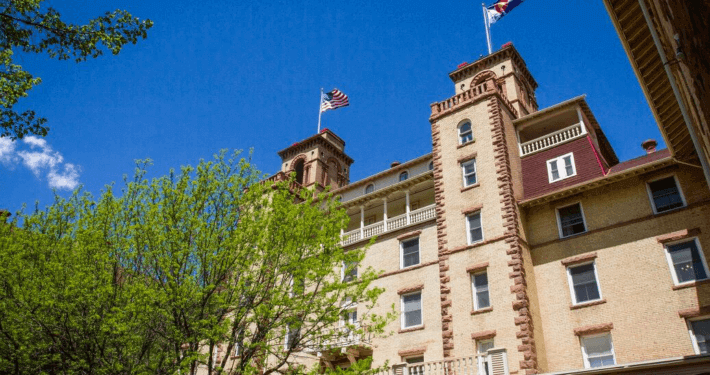 Hotel Glenwood Springs offers a great location, top-notch facilities and helpful staff to turn family reunions, sports team events or business conferences from ordinary to extraordinary. Capacity: Up to 50 people. This boutique hotel offers an intimate-sized space to accommodate your meetings or small reunion of up to 50 people! The Sunlight Lodge Bed & Breakfast offers a perfect destination for family reunions, youth groups and church retreats. Best of all, everyone in the group can stay under the same roof while enjoying plenty of privacy and personal space. Capacity: Up to 50 people! The Best Western Antlers a spacious, picturesque, and unique hotel property in the Roaring Fork Valley. This resort-style motor lodge is designed for relaxation and family fun. Capacity: Up to 45 people. This small oasis in the middle of Glenwood Springs, Colorado is the perfect hub for your next vacation. Capacity: Up to 40 people. With in-room kitchens, the Residence Inn is perfect for families desiring the flexibility of extended stay options. The hotel’s meeting room easily accommodates up to 40 people. Consider this beautiful location to host a special outside event! The indoor meeting area has a capacity of up to 20 people. Four Mile Creek Bed and Breakfast is located in a quiet valley just south of Glenwood Springs, Colorado. Originally homesteaded in 1885, Four Mile Ranch is listed on the National Registry of Historic Places. Capacity of up to 18 people. Planning a special and unique meeting? Consider these unique Glenwood Springs meeting locations!